Many businesses don't know how to use Twitter to achieve their promotional goals. They compare Twitter to impression-based models like billboards, TV, or radio, where the objective is to get impressions with as many ears or eyes as possible. But Twitter doesn't necessarily work that way. Because it's a social platform (which means it's basically a cocktail party), constant self-promotion won't work. But the ROI is out there - according to research by Nielsen and Twitter, 56% of consumers said the content they see on Twitter influences them when buying a service or product. To measure success, one of the best KPIs (key performance indicators) is Twitter engagement rate. This KPI works for prospective clients, existing clients and even customer service. To calculate engagement rate, simply take the sum of the number of clicks, retweets, replies, follows and favorites, and divide that amount by the total number of impressions. Start by making sure your Twitter profile appeals to your target audience and the type of service or product they need. Many companies overlook this step and have older messaging, poorly written profiles, or no profile or background image. Twitter also allows you to pin a tweet that will always show at the top of your profile, which is a great way to highlight a promotion or contest. You need to be noticed before you can influence. Show your brand's personality, and be a little controversial. Be funny, and don't be afraid to engage with your industry's leaders. 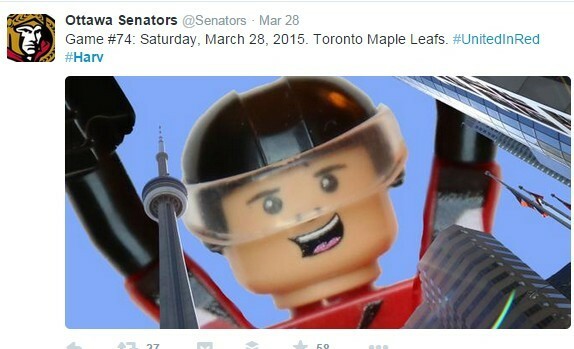 For example, the @Senators NHL hockey team used a LEGO character for game-day posts throughout their NHL playoff run. Use GIFs and images. A 2014 study of two million tweets showed that photos gave users a 35% bump in retweets. In a sea of tweets, using hashtags can help other interested tweeters find your content. Services such as Hashtagify clue you in to what's popular. A Microsoft study found that 18% of retweeted content contained hashtags. However, don't go hashtag crazy. If you're unsure how to go about hashtagging, check out this guide. But just because your tweets are findable doesn't mean people will share them. According to Jerry Low from Crazy Egg, "People are lazy. Tweets that need extensive editing work simply get fewer retweets. Ideally, you should limit your tweets to between 80 and 110 characters." When composing tweets, constantly test different variations. Buffer App follows a highly scientific approach when writing tweets. They measure headline variations, time of day, and a number of other variables to consistently improve upon their engagement rates. To make your tweets more compelling, use action words that work. According to customer service expert Shep Hyken, social media is powerful for displaying exemplary customer service in 2015. But your customer service department needs to be proactive by providing useful information and sharing videos and articles that answer pre-sale questions many people have. Hyken also strongly feels that speed counts, and companies should look to respond to a customer's question or issue through the same channel and as quickly as possible. The 2014 American Express Gold Customer Service Barometer indicated that 25% of consumers who complain on social media expect a response in less than an hour! With the above facts kept in mind, you should have no problem pushing your Twitter engagement numbers through the roof! Todd Jamieson is the President at EnvisionUP and has extensive experience in Internet Marketing, Web Development and Local SEO. To learn more about Todd, visit his company's website at EnvisionUP.com. Want more like this? Subscribe to Recruitment ADvisor and get the best news straight to your inbox! RealMatch is the leading recruitment advertising technology platform specializing in performance-based recruitment advertising solutions for digital publishers and employers. RealMatch combines programmatic job ad distribution with real-time job matching algorithms to automatically deliver top talent through its vast recruitment network, TheJobNetwork™. The company powers over 1000 job sites, granting employers access to local talent in every market while providing job seekers with perfectly matched opportunities! Are Indie Publishers the Strongest New Kid on the Block?